Last night we watched the two-hour Season 2 Finale of Hells On Wheels. We’d gotten hooked on the series, and while its story line is flawed, it’s worth watching. And it’s the only western you can watch. Why are the networks loaded down with cop dramas, but this is the only western to appear since Deadwood? I have to congratulate AMC for simply offering a different genre choice. Unfortunately, the finale was even more flawed and inauthentic than the regular season episodes. The show has been building up to a dramatic climax, and the issues in play were resolved, but not very satisfactorily. We finally had resolution on the two love triangles that have been ongoing. One of the triangles involved Eva, Mr. Toole and Ferguson. When Eva went to Ferguson’s house to tell him their affair was over, Mr. Toole caught her there and killed himself right in front of her. That was a surprise. It seems much more likely that he would have killed Ferguson, or Eva, or both of them. I have to think the writers created this outcome because Mr. Toole was a minor character, while Eva and Ferguson are major characters. So we ended up with an unlikely plot line to keep the major players from being taken off the stage. Basically, bad storytelling. The only time you can kill off a major character is in the season finale, because that actor is leaving the show. And that’s what may have happened to Lily, though I’m not convinced yet she is dead. She was strangled by the evil Swede, the primary villain in the series, but we didn’t see her buried, so maybe the show left room for the miraculous discovery that she is still alive at the beginning of next season. Or maybe she’s gone from the show for good to pursue a movie career. Only season three will answer this question. Killing off Lily was a strong move, the best plot device in the finale. However, the revenge taken by her lover, Bohannon, the series’ main character, was weak. He allowed the Swede to escape death in a cheesy way that the hero should have easily seen coming. Another weakness was the attack of the Sioux. First of all, the Sioux didn’t attack at night, as shown. It’s not like there was night vision gear back then. You had to attack in daylight to see what you were shooting at. But that’s not even the biggest flaw. Supposedly a few men from the town held off hundreds of Sioux warriors. That just couldn’t happen. If the story were true to life, the Sioux would have killed everyone, not just burned down the town and wiped out a few walk-on characters. Still, I look forward to season three. Anson Mount as Bohannon has style and charisma, and the other actors are engaging. The show has an effective, evil villain in the Swede and it will be worth tuning in next season to see Bohannon try to exact revenge on him. I will miss Lily, if she is truly dead, because she brought a pluckiness and independent spirit to her role, and she and Bohannon were just beginning their romance and I would like to have seen it grow and develop. One thing that is disappointing is that the show’s executives decided to bring in Virginia Madsen at the end of the season to play the railroad owner’s wife. Previously, the show had no big name actors. I always suspect that movie stars are brought onto TV shows in an attempt to boost the ratings through their star power. If this was the idea, it failed. Madsen looked like she’s packed on some pounds and wasn’t given much of a pivotal role in the drama. A no-name actress would have been a better choice. 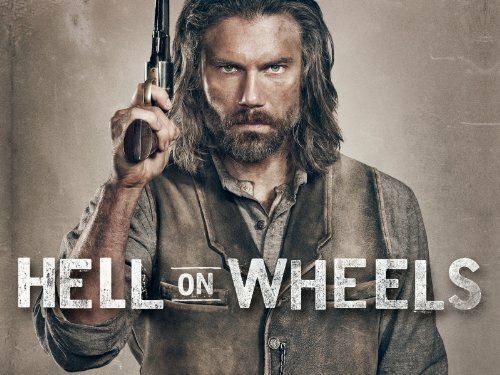 While Hell On Wheels may never come close to the writing in AMC’s other smash shows like Mad Men or Breaking Bad, it is entertaining and it has created some memorable characters. It just needs to be as true to its time period as Mad Men and as well plotted as Breaking Bad to get up on the level of those shows. But even as it is, it’s better than most of the fare on television, especially the major networks. Good enough that I’ll be right there watching when season three rolls around.